Simplilearn’s Finance for Non-financial Professionals Certification Training is ideal for business managers who wish to get a working knowledge of core financial principles and understand how financial decisions impact a company’s financial health. You’ll learn to read and analyze financial statements, use financial controls to meet business objectives, translate performance into financial terms, communicate with financial teams and take the guesswork out of critical decision-making. Simplilearn’s finance training program for non-financial professionals is designed for managers to enhance their fundamental financial skills and understanding of how financial principles impact the business. The program will introduce you to core financial concepts and show you how to understand financial documents, manage budgets, analyze financial performance and implement a range of financial controls to meet business objectives. You will develop the right financial skillsets to operate effectively in today’s complex business environments and address the ever-changing business needs of your organization. Why is this certification so desirable? Comprehend relevant financial information within the organization. Understand the impact of various business decisions on the organization’s performance. According to the recent surveys by payscale.com, the median salary of a certified professional in this field is $82,563 per year. Certified professionals are in great demand in companies around the world. This course is ideal for managers or other professionals who do have financial or accounting backgrounds and need a basic foundation in key financial documents and processes. Why choose Simplilearn for your training? Robust learning management system (LMS) designed to ensure you pass your certification tests on the first attempt. What are the exam prerequisites? There are no prerequisites to take this course. However, candidates should complete the online course within the stipulated time and pass the sample test papers with minimum 72% before they appear for the final examination. Very flexible and easy to understand. I am now more well versed with financial terms relevant to operating a business. Excellent course that provided the information I was in need of. Great course! This is the kind of information I really need at this point in my life when I'm moving on to finance domain. This course from Simplilearn has provided me an insight into the basic concepts of accounting and finance. Now I can effectively communicate with the financial managers. This course is great in explaining how to become better equipped in financial domain. The structure of the course has been well planned - each lesson is presented with great clarity. 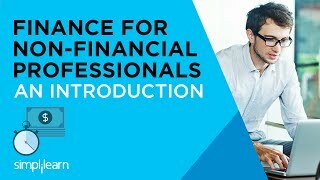 I have enrolled in Finance for Non-Financial Professionals course at Simplilearn. It was a great learning. The course content is really good and helpful for professionals. I would love to recommend Simplilearn to my friends. Thanks to Simplilearn for enhancing my Financial and excel skills. You will have access to the online e-learning content, chapter-end quizzes and practice tests. Yes, you can extend the access period by paying an additional fee. Please contact our Help and Support portal for more information.